With the state media going into a propaganda overdrive to hardsell the PAP’s immigration policy to Singaporeans in the last two weeks, few dare to ‘sing a different tune’ to contradict the party’s directive except one brave soul. MediaCorp artiste Tay Ping Hui may be wearing the white uniform of the PAP, but he often broke ranks with the party and does not mince his words when criticizing its policies. Ping Hui has just been awarded the ‘Best Actor’ for his performance in the drama ‘Bountiful Blessings’ at the recent Star Awards. MediaCorp celebrity and Young PAP member Tay Ping Hui has spoken up again on the behalf of Singaporeans against the uncontrolled influx of foreigners into Singapore. Despite the rising concerns among Singaporeans that they will soon be ‘squeezed out’ by the newcomers, Deputy Prime Minister Tharman insisted that Singapore must remain ‘OPEN’ to ‘foreign talents’ or risked having their competitiveness decreased as foreigners help create jobs for Singaporeans. With the lines between Singaporeans and foreigners getting increasingly blurred, it is now difficult to judge who truly deserve to be allowed to enter Singapore. Despite receiving numerous brickbats from netizens for his feeble attempts to create discord within the opposition camp by mooting the possibility of the National Solidarity Party (NSP) sending its star candidate Nicole Seah to contest in Hougang by-election which eventually forced Nicole to issue a public statement denying she would do so, beleaguered former WP and NSP leader Goh Meng Seng continues to take potshots at the Workers Party on his personal blog. In his latest post written yesterday, Mr Goh proposes that the PAP send MediaCorp celebrity Tay Ping Hui who was applauded by many netizens lately for speaking out against NUS PRC scholar Sun Xu to contest in Hougang. Meanwhile, angry and irate netizens continue to lampoon Mr Goh in cyberspace with many condemning him as a ‘PAP stooge’ out to destroy the Workers Party. Mr Nathan is the longest-serving Elected President in the history of Singapore. Though he has relinquished his position, he is still widely respected by Singaporeans and has been gracing public events and giving talks at conferences. NUS alumni and MediaCorp actor Tay Ping Hui has expressed his disappointment at NUS’s unprecedented move to delay announcing the verdict on its ‘beloved’ PRC scholar Sun Xu during a disciplinary hearing this Tuesday. In a short statement released to the press, an NUS spokesperson said “a decision is likely to be made in one to two weeks after the inquiry” after which Sun Xu will be given another 14 days to appeal against the decision if need be. By then, Sun Xu would probably have completed his final year exams successfully. While private school East Asia Institute of Management sacked its PRC student Wang Peng Hui immediately after his video making racist jaunts at Singaporeans went viral online, NUS will only announce the decision one or two weeks later. A final year student in Mechanical Engineering at NUS, Sun Xu sparked near nationwide outrage with his now infamous remark on ‘there being more dogs than humans in Singapore’ on his Chinese microblog Weibo. His views were shared by many netizens who accused NUS of ‘buying time’ for Sun Xu to graduate. In a poll conducted by The Temasek Times, more than 97 percent of some 930 respondents thought so. Though Sun Xu’s scholarship was given by MOE, it has refused to take any disciplinary action against him so far, leaving the decision entirely on the hapless disciplinary committee of NUS which has received much flak from the public over its handling of the matter so far. In response to queries from the media, MOE said it was not represented in the Board of Discipline and will “let the disciplinary process take its course”. It reiterated that “the NUS scholarship administrators will take reference from the findings of the Board in deciding what action they will take with regard to Sun Xu”. With NUS PRC scholar Sun Xu due to attend a disciplinary hearing tomorrow, Young PAP member and MediaCorp actor Tay Ping Hui has implored the authorities to heed the voices of the people. MOE and NUS have been dragging their feet over Sun Xu’s case in the hope that Singaporeans will forget about the incident by now, one month after Sun Xu posted a derogatory comment about Singaporeans on his Chinese micro-blogging site Weibo on 18 February this year. A final year student in Mechanical Engineering at NUS, Sun Xu triggered nationwide outrage with his now infamous remarks on there ‘being more dogs than humans in Singapore’, prompting many Singaporeans to call for his scholarship to be revoked, including Tay Ping Hui who openly called him an ‘impertinent ingrate’. Despite keeping a low profile in the last few weeks, Singaporeans remain fixated on the saga with some netizens predicting Sun Xu’s eventual fate today even before the disciplinary hearing is convened. Though the majority of netizens want Sun Xu’s scholarship to be revoked and NUS to expel, few believe NUS will do so with many predicting that he will be let off with simply a ‘stern warning’ which will have no impact on his scholarship. Senior Parliamentary Secretary, Ministry of Education & Ministry of Law Ms Sim Ann revealed recently in Parliament that the Singapore government spends some $36 million dollars on scholarships to over two thousand foreign students each year, or about S$174,00 per scholar. MediaCorp actor and Young PAP member Tay Ping Hui has openly called for the expulsion of embattled NUS PRC scholar Sun Xu from NUS for breaching its code of conduct for students. A final year student in Mechanical Engineering at the National University of Singapore, Sun sparked a near nationwide outcry among Singaporeans with his offensive remarks on there “being more dogs than humans in Singapore.” on his microblog ‘Weibo’ two Saturdays ago, prompting many to call for his scholarship to be revoked. 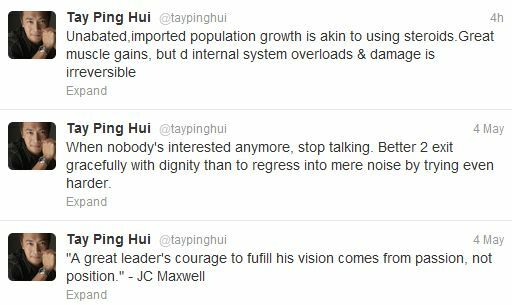 Unlike some PAP MP who tried ways and means to exonerate Sun Xu from public opprobrium, Tay Ping Hui was one of the few public figures to step forward to condemn him, calling him an ‘impertinent ingrate’. Unfortunately, it appears that both MOE and NUS are now taking turns to ‘tai-chi’ the ‘hot potato’ to each other in order to escape public scrutiny and wrath. When two Singaporean students were caught kissing publicly in school, they were expelled immediately from their junior college by MOE. However in this case, MOE prefers to wait for NUS to ‘investigate’ first. A week later, Education Minister Heng Swee Keat passed the baton to NUS completely, saying in an interview with Lianhe Zaobao that NUS should investigate the matter and takes disciplinary action against Sun Xu if he was found to have flouted NUS’s code of conduct for its student though it is the administrator of Sun’s scholarship. Though Schlumberger has stopped Sun Xu from visiting the company, one NUS engineering student told us that the move is merely ‘symbolic’ as he has already completed his Final Year Project. Sun Xu is expected to attend a disciplinary hearing on 13 March 2012 where his fate will be decided. Born to a wealthy and influential family in the affluent city of Suzhou, Jiangsu province, Sun Xu first came to Singapore in 2006 on a MOE scholarship to study in River Valley High School after which he went on to study at Raffles Junior College and NUS where he majored in Mechanical Engineering. Foreign scholars like Sun Xu at NUS and other Singapore universities have their tuition fees and living expenses all covered by their scholarships. They are also guaranteed a well-paying job upon graduation as part of their bond and the men are exempted from National Service unlike male Singapore citizens who are burdened with a hefty tuition loan and rendered uncompetitive in the job market by their mandatory reservist obligations such as IPPT and in-camp training. MediaCorp actor and Young PAP member Tay Ping Hui won praises from many Singaporeans lately for speaking out against NUS PRC scholar Sun Xu on his Twitter. In response to Sun’s insensitive remarks, Mr Tay slammed him in a tweet, calling him an “impertinent ingrate” which made him an instant hero in the eyes of long-suffering Singaporeans yearning for somebody to step forward to speak up for them. Mr Tay’s comments were widely reported in the mainstream media and it appeared to be well received by ordinary Singaporeans, one of whom approached him to thank him for doing so. Tay Ping Hui was initially considered as a possible PAP candidate in the General Election last year, but he was not fielded in the end and it might have something to do with his ever willingness to speak up for Singaporeans even when it is not politically correct to do so. 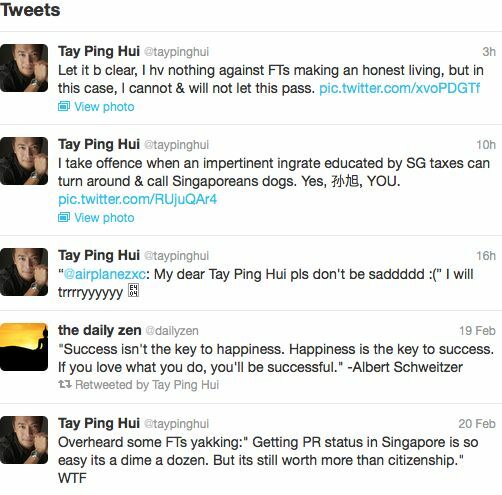 Celebrity Tay Ping Hui scolds NUS PRC scholar Sun Xu: You are an impertinent ingrate! While NUS continues to act blur on its PRC scholar Sun Xu’s insensitive remarks made on his microblog ‘Weibo’, more and more Singaporeans are stepping forward to condemn him, including Young PAP member and celebrity Tay Ping Hui. According to information posted on his linkedin account before it was taken down, Sun Xu came to study in Singapore in 2006 on a MOE scholarship for students from China. After graduating from Raffles Junior College in 2008, he went on to study Mechanical Engineering at NUS, also on an undergraduate scholarship provided for by the Singapore government. He is currently on attachment at Schlumberger, an international oilfield services company and is expected to graduate this year. During a parliamentary session this week, it was revealed that the Singapore government spends some $36 million dollars on scholarships to over two thousand students each year, or about S$174,00 per scholar.